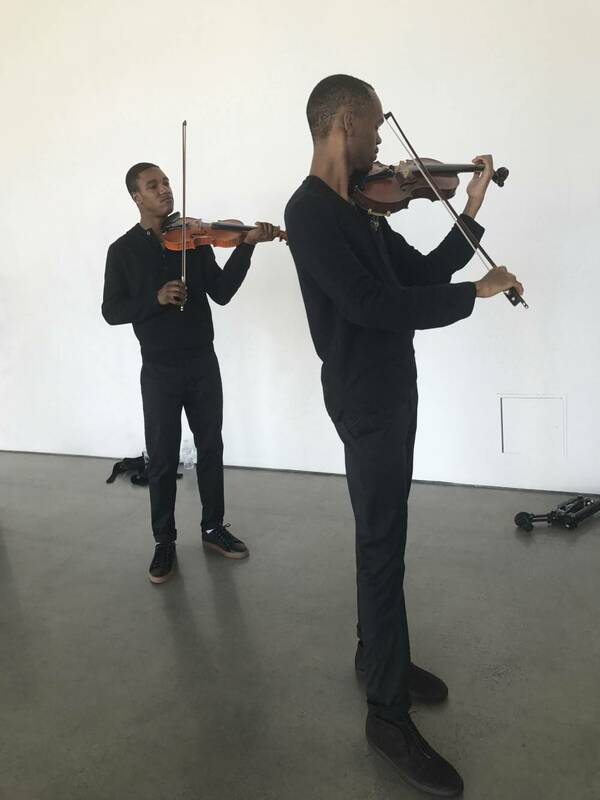 On the busy streets of SoHo, playing Mozart’s Divertimento in D on dueling violins, OnyxViolins stopped our creative director, Len Peltier, in his tracks.”I first stopped to appreciate the music, then ran back to get their contact info. I really wanted to work with them,” he recalls. 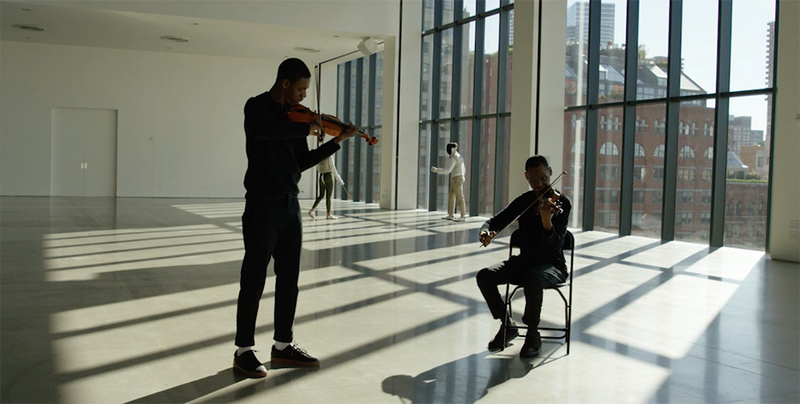 Blending streetwear and classical music, Sean Bennett and Samir Robinson are setting new standards for modern performance. 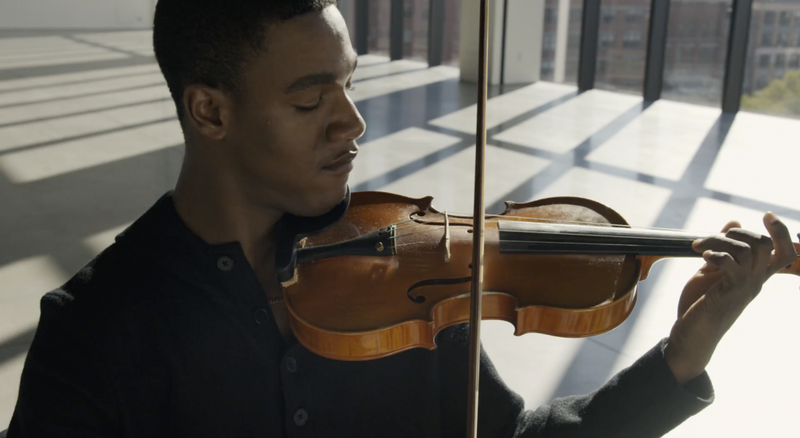 Sean and Samir didn’t originally choose to play violin—it chose them. For Sean, there were no more cellos left at school so he had to play second fiddle before quickly falling for the smaller instrument. For Samir, it was a matter of happenstance as he tagged along with his sister for her practice, and then started playing just to keep her company. Fast forward a few years and the two met through mutual friends, who couldn’t get over their likenesses. “It’s funny because people were saying we could be twins,” says Sean. With similar styles, looks and personalities, it’s no denying the two are a seamless duo. Their ability to masterfully infuse modernity into the traditional sound of the violin is uncanny. When asked to be part of our January Tailored Performance video they composed a transcription of the rhapsodical concert piece “Csárdás” by Vittorio Monti, for two violins. Set against a fencing bout between Olympic athletes Race Imboden and Ysaora Thibus, OnyxViolins bring a fresh play to a folkloric classic. OnyxViolins aren’t afraid to take risks, with their fashion or music. “Sean and I can relate to one another when it comes to fashion. Streetwear is the basis of Sean’s style, with a little playfulness.” After performing in the Rapid Movement Chino in our video, they shared how they’d wear our best-selling pant IRL. Sean’s take: high-top retro sneaker, a graphic t-shirt and a blazer to wear to an orchestra rehearsal. For Samir: a basic sneaker for a day out street performing. Like their style, OnyxViolins’ art is constantly evolving. “We believe that music, as well as fashion, is organic characteristics of life on Earth,” says Samir, which is fitting for a duo who named themselves after one of the world’s most valuable minerals. With performances in concert halls and on sidewalks alike, from New York to Philadelphia, OnyxViolins are always on the go. While they don’t play by any rules per se when it comes to style, they are always looking for pieces designed to move as much as they do. See OnyxViolins in action wearing our Rapid Movement Chino and find your perfect pair.